COLLEGE STATION, TX – The Texas Southern Tigers faced #24 Texas A&M in College Station for a cold and wet night game. Shortstop Chris DeLeon had the best showing for the Tigers with two hits and one RBI. 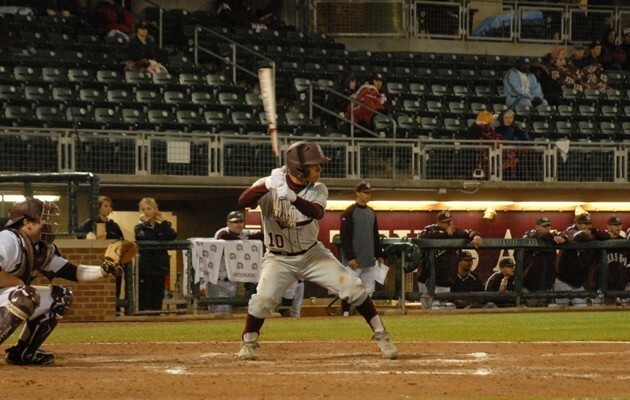 Corbin Smith and Ellis Stephney had one hit each against the Aggies. The Tigers’ best inning came in the 6th when Sebastian Stargell walked with one out. Smith bunted for a single which pushed Stargell to second base. DeLeon then singled to left field and Stargell scored. Texas A&M retired the side on the next two TSU batters. The Tigers fell to the Aggies 1-7, but head coach Michael Robertson said his team performed well against a program of this caliber. Adrian Losoya started on the mound. He pitched 3 innings with 2 strikeouts, 5 hits and 4 earned runs. Four other pitchers got some work in and recorded 1 strikeout while giving up five walks. “We will work on things we need to improve, but we believe in what we are doing and we will get better the more we play,” Robertson said. Texas Southern will play in the MLB Urban Invitational on Friday, Saturday and Sunday at Minute Maid Park. They will face Southern at 3:00pm Friday, Prairie View at 8:00pm on Saturday and Alabama State on Sunday at noon. This will be the Tigers’ second season playing in the MLB Urban Invitational.